The leader of the nation’s eldest daughter, Dariga Nazarbayeva, indicated she has no intention to run. While announcing Kazakhstan’s snap presidential election on April 9, President Kassym-Jomart Tokayev omitted to say whether he would run. But in just three weeks in charge, he has already begun to look like the leader-in-waiting. Tokayev, 65, has toured the provinces to glad-hand people, popped over to Russia to meet with Russian President Vladimir Putin and announced populist decisions. Billboards with his image have already begun appearing. When Kazakhstan goes to the polls on June 9, the list of options will be very short. It always is. When Nursultan Nazarbayev got 97.5 percent of the vote in April 2015, his only opponents were a pair of faceless nobodies. Initial indications are that the plan is for the new man to be eased into elected high office with similar smoothness. Tokayev attributed the hasty vote to a desire to spare the country the anxiety of not knowing what comes next. “In order to ensure social and political harmony, to confidently move forward, to address the demands of social and economic development, it is necessary to get rid of any uncertainty,” he said during the April 9 televised address. In a message distributed via the Telegram app after the announcement, Tokayev’s recently appointed advisor, Yerlan Karin, reiterated the point and sought to impress the democratic nature of the planned election. “It is not by chance that the head of state emphasized that ‘the president will be elected according to the will of the people.’ This is a key passage in his address,” Karin wrote. And yet, the rules are such that very few people will be able to get over the multiple hurdles placed before prospective candidates. Only officially registered political parties and public organizations may put a person forward. All groups critical of the authorities have been categorically denied such registration, so government-detractors are shut out by default. What is more, candidates should in theory be nominated by their backers no later than two months before the vote. Tokayev’s last-minute declaration elicited indignation for that reason. “What open elections are we talking about if political parties and public organizations have just a little more than one day to put forward their presidential candidate? Under our laws, self-nominated candidates are barred from running,” journalist Vyacheslav Abramov wrote on Twitter. If candidates are not nominated before the deadline, however, election officials will grant another extension of up to 20 days. Should the plan be for him to run, Tokayev’s nomination is a given. That endorsement would invariably come from the ruling Nur-Otan party. Aikyn Konurov, the head of the Communist People's Party of Kazakhstan faction in parliament, was quick to express his readiness to compete. Konurov is a lawmaker with little public profile and his party is an ersatz left-wing political formation, so his candidacy or that of a similar figure would serve the traditional function of creating the impression of competition. William Courtney, a former U.S. Ambassador to Kazakhstan, lamented that the way the election had been announced was a blow for democracy. “Snap election in Kazakhstan allows little time for prominent leaders with independent political bases to organize candidacies [and] appeal for public support. People of this great country deserve better than another dishonest election,” Courtney wrote on Twitter. There had been speculation among hobbyist tea leaf-readers that Nazarbayev’s eldest daughter, Dariga Nazarbayeva, 55, was being lined up to take up the presidency. But her assistant swiftly scotched that idle chatter on April 9. “No, Dariga Nursultanovna has no intention to run,” her assistant, Saule Mustafayeva, said in succinct remarks to Tengri News. Nazarbayeva will remain an intensely scrutinized figure for years to come, however. Shortly after Nazarbayev announced his retirement last month, he was replaced, in line with the constitution, by the Senate speaker, Tokayev. That seat was then filled by Nazarbayeva, who now serves in effect as reserve president. 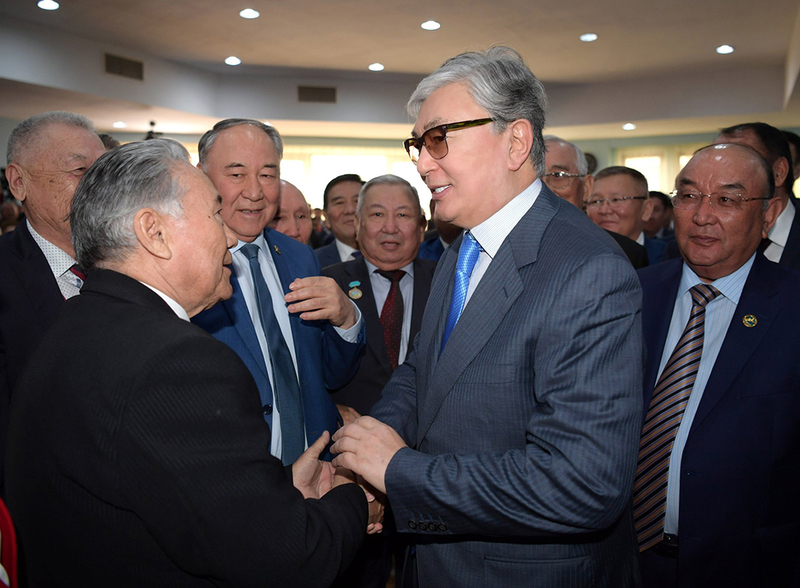 In a comment given to Eurasianet before Tokayev’s announcement, opposition politician Amirzhan Kosanov leaned toward ruling out a Nazarbayeva run for office. “The dynastic variation could provoke protest not just in society but also among the in-fighting clans, which also include other members of the Nazarbayev family. In that respect, Tokayev can be seen by Nazarbayev as a transition president,” Kosanov said. This latter remark reflects the continued role that Nazarbayev will play in running the show from behind the scenes. As lifelong chairman of the Security Council, Nazarbayev retains wide-ranging powers and an important stake in policymaking. The residential administration website continues even now to feature updates on what the former president is doing. A strict interpretation of the constitution should, theoretically, also rule out Tokayev, since one article in the document states that candidates must have spent the last 15 years “living on the territory of Kazakhstan.” From 2011 to 2013, Tokayev lived in Geneva while serving as director-general of the United Nations office there. Such fine legalities are unlikely to derail things. The glimmers of politicking make it clear that Tokayev is looking to hang around. In one notable executive decision this week, Tokayev revealed that he was behind the idea of putting on hold a long-gestating project to build a highly contentious ski resort. The Kok-Zhailau initiative had met stiff resistance among vocal sections of civil society concerned about its likely detrimental impact on the environment. “This was a good political maneuver, which will give Tokayev a significant edge in the eyes of the electorate,” Kazbek Beisebayev, a retired veteran diplomat, told Eurasianet. Beisebayev also pointed to the recent easing on the periodic blocks on social media websites, which have generated much grumbling. And on March 22, in what looks like electioneering-before-the-fact, Tokayev ordered a wage hike for government employees planned for July 1 to be brought forward to June 1. “This decision will directly affect the lives of more than 1 million citizens and government servants,” he tweeted. In the unlikely looking event that Tokayev is not confirmed as president by the ruling elite, the chances of a genuinely competitive contest are anyway all but nonexistent. Political analyst Dosym Satpayev echoed many a jaded observer’s cynicism with his tweet. “In some countries, the intrigue is all about who will win the election. Here, the intrigue is who will be appointed to win the ‘election,’” he wrote. Peter Leonard is Eurasianet’s Central Asia editor. Sign up for Eurasianet's free weekly newsletter.